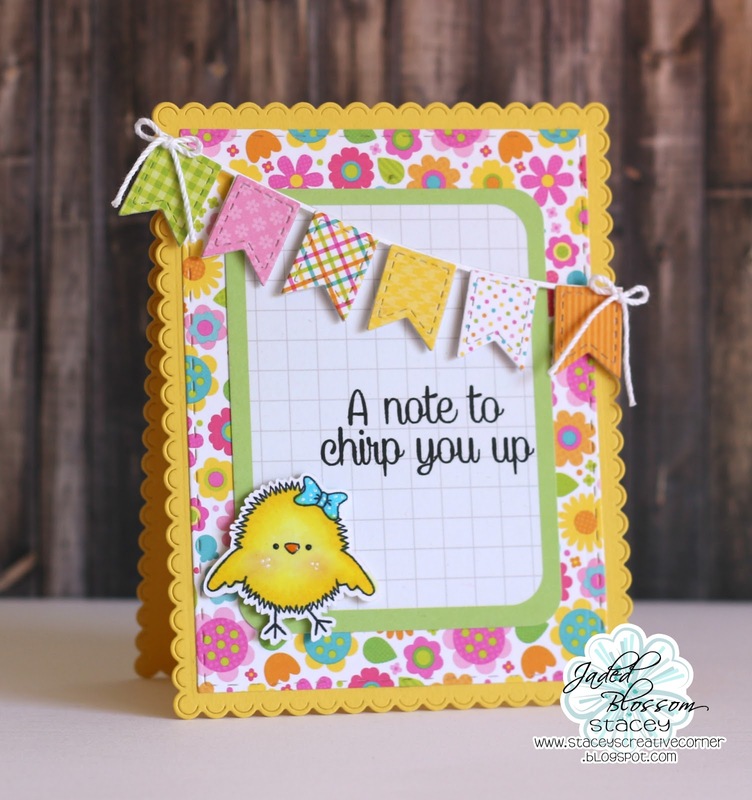 Stacey from Stacey's Creative Corner with you today to share a card that I made using some of those fabulous stamps and dies from Jaded Blossom! I created my card base by adhering two panels together that I cut out using the Scallop Rectangle Dies 2 set. This is one of my favorite things to do! I love the cute scallop edge on the card. Anywho, I used the Rectangle Dies 2 to cut a stitched rectangle from some floral patterned paper and layered it on top of my card base. I found this journal card in my Project Life stash and stamped my greeting from the Hey Chickie stamp set with some Versafine ink and added it to my card front. I colored up that sweet little chick, also from the Hey Chickie stamp set and popped her up with some foam tape. I thought the card needed a little something more so....Banner Dies to the rescue! I cut out my banner and layered some fun patterned paper and adhered it to my card with more foam tape. I finished it off with some little crochet thread bows at each end. I think this turned out so super adorable!! I love this!! It's so adorable!! Great card! Love the fun papers and colors. The banner is so fun and the chickie is adorable! Adorable card, I love the fun colors!! !